parks connected by 12 miles of scenic road that winds through the pines. The park road is perfect for biking or for enjoying a leisurely drive." After reading that Bastrop is one of the more popular parks in the Texas state park system, I was curious to find out why folks like it so much. Both Bastrop and Buescher (pronounced Bisher) are fairly close to McKinney Falls so it made sense to check them out while we were in the Austin area this time. Our primary goals on our first visit were 1) to determine whether we wanted to camp at Bastrop for three days before heading to Huntsville SP, 2) to see what the park trails were like, and 3) to see if that 12-mile road linking the parks was suitable for me to cycle. 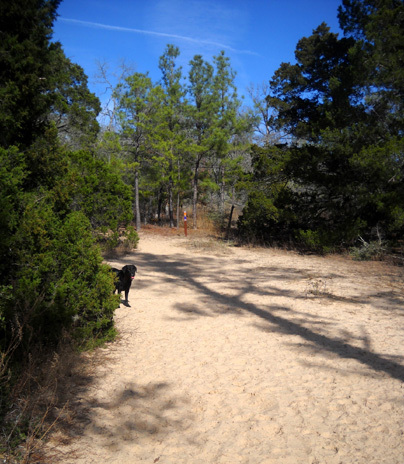 Although we decided not to move to the campground at Bastrop we drove back another day to run/hike some of the trails in the park. 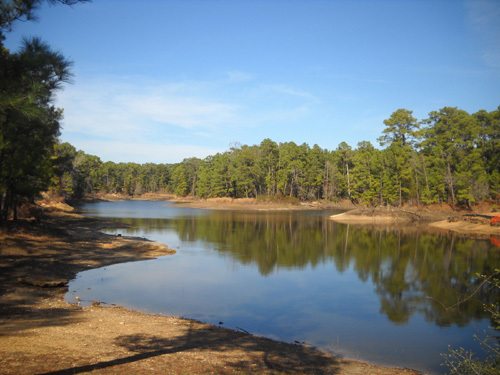 Both Bastrop and Buescher state parks are located in an isolated timbered region of loblolly pines and hardwoods that is called the "Lost Pines." 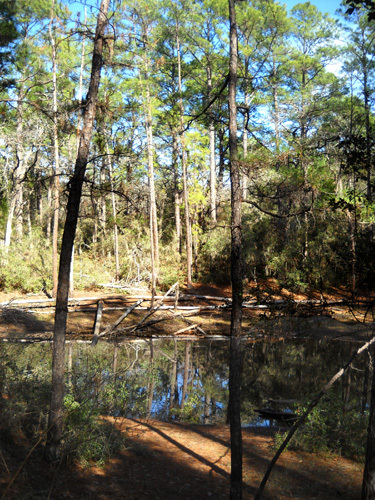 It is separated from the main body of East Texas pines by a hundred miles of post oak forests and covers 75,000 acres (70 square miles) in five counties on the Texas coastal plain. 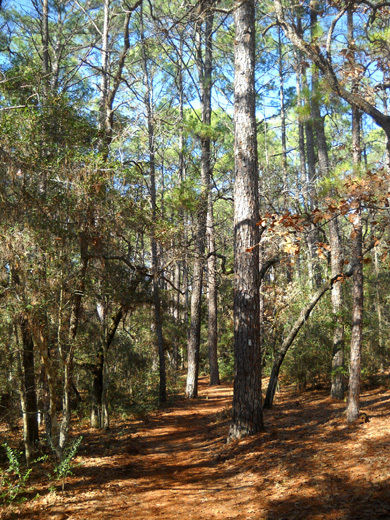 Almost one-tenth of this unique pine forest is located in Bastrop and Buescher state parks, which are dedicated to preserving this ecosystem and protecting it from farming, logging, and urbanization. 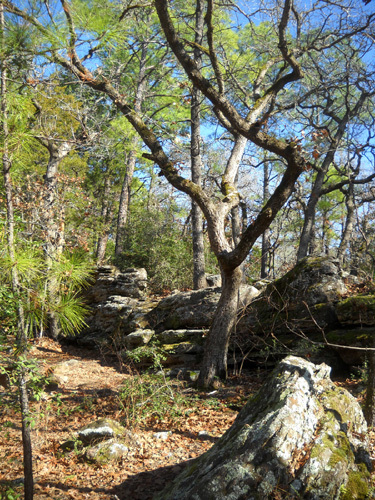 The "lost pines" have persisted in this area of sandy, gravelly soil for about 18,000 years. They represent the westernmost stand of loblolly pine trees in the U.S. The ecological region in which they grow is known as Post Oak Savannah. It is a mosaic of pines, oaks, shrubs, grasslands, and mixed flowering plants. This diverse environment supports many species of wildlife like white-tailed deer, bobcats, rabbits, squirrels, opossums, armadillos, the endangered Houston toad, and about 250 kinds of birds. 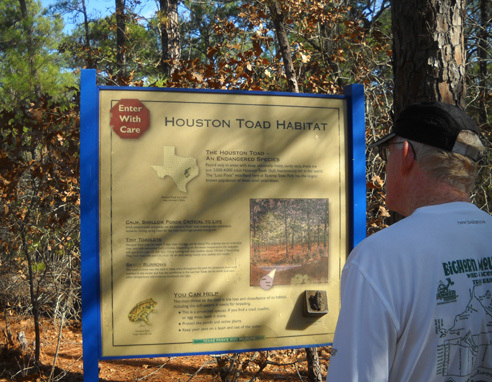 Jim reads an interpretive sign about endangered Houston toads. The park websites both mention that portions of the trails and Park Road 1C may be closed between October and January for prescribed burns and/or road paving. That prompted a phone call. We learned that the road and all the trails would be open while we were in Austin. The last burn was about a month ago and the paving probably won't start until the end of 2011. Prescribed burns are necessary in many state and national parks to reduce undergrowth that can fuel large wildfires and to improve the overall health and viability of the forests. We could see evidence of recent controlled burns but were glad none were going on while we were there. That's the subtitle of one section in an interpretive guide we picked up about these two parks. You can download the guide at either park website: Bastrop or Buescher. In the early 1930s the National Park Service (NPS), the Civilian Conservation Corps (CCC), and what is now called Texas Parks & Wildlife Dept. (TPWD) teamed up to design and construct buildings, roads, dams, bridges, fences, and other facilities in many Texas parks. 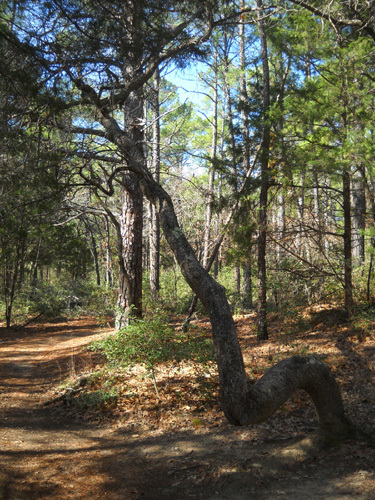 Two CCC companies arrived at Bastrop and Buescher state parks in 1933 to transform almost 7,000 acres of over-cut and tangled forest into two beautiful public recreational areas. 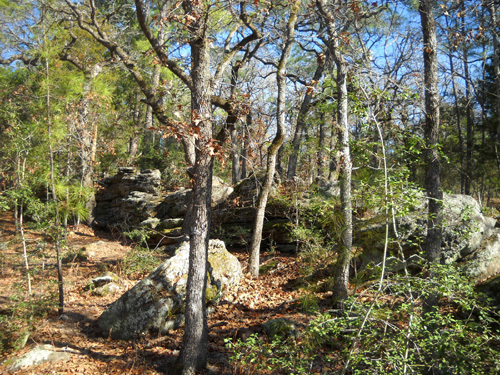 Structures like the fences and stone cabins at Bastrop were designed in harmony with the environment so they appear to be part of the natural landscape. The park's CCC showpiece is the refectory, a handsome dining hall built from cedar, oak, walnut, and pine indigenous to the park and red sandstone quarried nearby. The structure features carved mantels, roof beams, and furniture. Because of this legacy of CCC fine craftsmanship, Bastrop was awarded National Historic Landmark status. It is one of only five CCC parks in the entire country with this recognition. Unfortunately, we didn't know that until after our two visits to the park and we didn't see the refectory or cabins. Rats. Guess we'll have to go back another time, eh? The Scenic Overlook pavilion was built by the CCC in the 1930s. 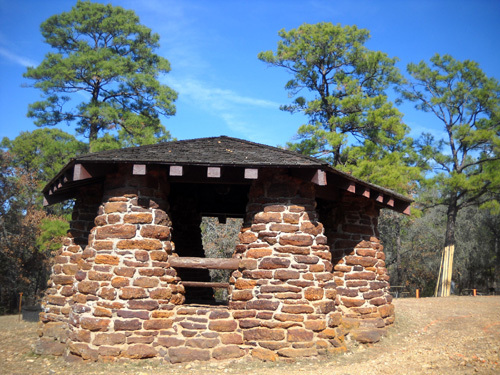 You can see photos of some of the CCC buildings at Bastrop on the official park website and at the link to a video of the park. Buescher doesn't have a separate video. At 5,926 acres, Bastrop is by far the larger of these two parks and offers more trails and other amenities. Buescher comprises 1,016 acres of hilly, wooded land. Popular activities at both parks include picnicking, camping, hiking/running, cycling, fishing, non-motorized boating (both parks have rather small lakes), nature photography, wildlife viewing, interpretive programs, and the scenic drive between the parks. Bastrop also offers golfing on an 18-hole course and swimming in a large oval pool in season. The lake at Bastrop SP is very low right now. 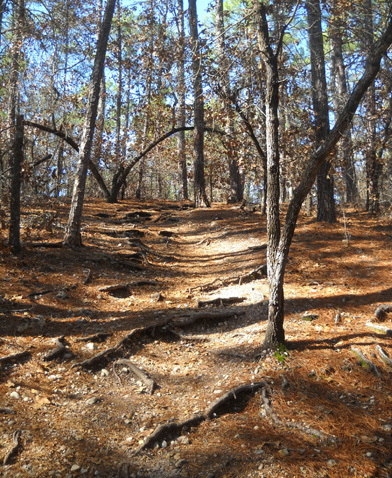 Bastrop has eleven trails, several of them spurs, ranging in length from 1/10th of a mile to 8.5 miles. Most are less than a mile long. Total trail distance is about twelve miles. I'll talk more about the trails we ran later in this entry. Buescher has one 7.7-mile loop trail we didn't see. Both parks have lots of paved miles for road runners. I'm not sure how many of these trails can be used for mountain biking. Bikes are not allowed on the Lost Pines Trail. Both parks' websites encourage the use of winding, hilly, narrow, paved Park Road 1C for cyclists, although the Buescher home page indicates it is for "experienced" cyclists. After we drove it in our truck, we decided neither of us is trained for hills like those right now! Note to folks with RVs: unless you have a very small motorhome or camper, you don't want to drive it on Park Road 1C between the two parks. In addition to the steep grades and narrow width of the road, there are also some tight curves and low-hanging branches. Enjoy the road in your tow vehicle, toad, bike, or on foot. Speaking of RVs . . . Both parks have RV and tent camping sites with or without water and electricity. Bastrop has weekly and monthly rates during the winter months. The sites are a little larger at Bastrop than they are at Buescher -- but not nearly as generous for medium to large RVs as some other Texas state parks we've visited. We decided we were better off extending our stay at McKinney Falls SP instead of moving over to Bastrop for three days. 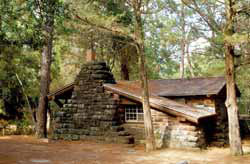 Bastrop also offers youth group camping, eleven rustic stone cabins, lodges, group barracks, and two large dining halls. Buescher has several limited-use cabins, screened shelters, a group picnic pavilion for day use, and a recreational hall for day/night use. Both parks have picnic areas for day use. Check the two park links above for further information about camping, facilities, and fees. Our first visit to the parks was on a chilly, damp, overcast day when we weren't real motivated to get out of the truck! We ran and walked at McKinney Falls that morning before driving over to Bastrop and Buescher. The closest park, Bastrop, is about 30 miles from McKinney Falls, Buescher about 40 miles (we returned via four-lane US 71, not Park Road 1C). All we did on our first visit was drive through the parks and on the scenic road that connects them. 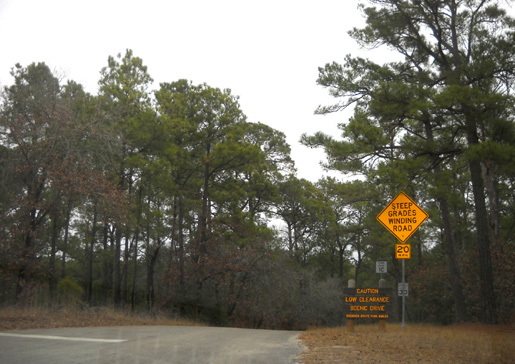 The entrance road at Bastrop bisects the golf course, an attractive introduction to the park. 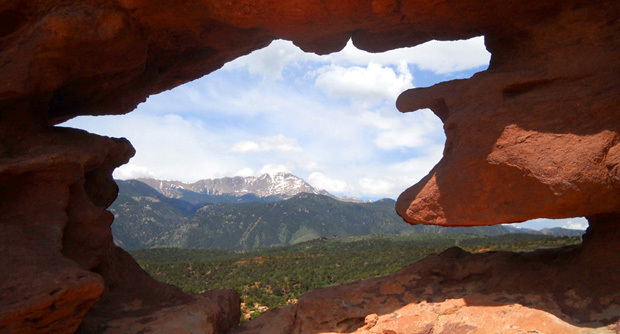 Our state park pass allowed us free entry; visitors without a pass must pay $4 per person over age 13 per day. 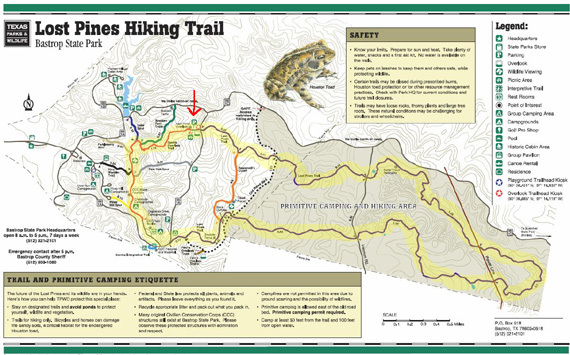 We picked up a park map and a separate trail map that shows details of the hiking trails, including the Lost Pines Trail. Check the Bastrop website to see a map of the park. We drove through the Piney Hill RV campground first, then followed Park Road 1A counter-clockwise in a convoluted loop on the south and east sides of the hilly, heavily-forested park. We turned in to look at the Copperas Creek camping area. It's an appealing place to camp but the sites are too small for our rig. We passed several trailheads on our way to the juncture with Park Road 1C. All the single-track trails looked inviting from the road. We turned right on 1C, missing the last quarter of the loop around Bastrop. We made sure we saw that when we returned a few days later to run/hike the Lost Pines Trail. We passed the lake but didn't drive up the road (1B) to the area with the CCC cabins. Park Road 1C is indeed hilly, narrow, and winding. The speed limit is only 20-30 MPH so it took a while to drive the twelve miles to Buescher SP. The first part of the road is through quiet, forested, undeveloped park terrain. Several miles of the road at the southeastern end near Buescher are on private property. Although we saw one business and some driveways to cabins in the developed section, we saw very few vehicles on the road the weekday afternoon when we were there. We entered Buescher from the north, the "back door" on the opposite side of the paved park loop from the entrance station. We didn't see a self-pay station . We knew our parks pass was good, so we didn't worry about having a permit on our windshield from Bastrop and not Buescher. I guess they figure anyone entering Buescher from that side has already been through the gate at Bastrop. We weren't in Buescher State Park very long, just long enough to drive through two of the campground loops (Lakeview and Oak Haven) and determine the sites weren't big enough for our rig. They are pleasant sites, however, for small to medium RVs. We followed Park Road 1C around the western half of the park. We didn't drive on the park road (1E) that passes the trailhead for the 7.7-mile hiking trail loop but assume it's similar to the trails at Bastrop -- heavily forested and hilly. I don't have any photos of Buescher SP. If it had been a sunny day, I would have been more likely to take pictures! We stopped at the park headquarters on the way out of the park to get a park map and ask some questions. Visitors who enter the park from FM 153 off US 71 either enter free with their state parks pass or pay $4 per person (age 13 and up) per day. Today, our last full day in the Austin area, we finally made it back over to Bastrop for a long run. It was a beautiful sunny day this time, pretty warm for us in the upper 60s F.
We aren't acclimated to upper 60s but we didn't complain! We are soooo tired of winter weather. I know that map is too small to read but I wanted to show you the general layout of the trails at Bastrop. 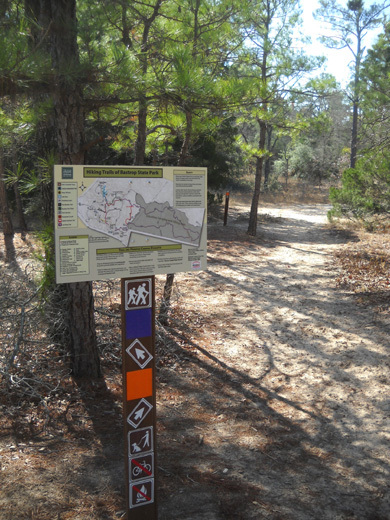 To see a full-scale map, go to the trails link on the Bastrop SP website. Jim ran the entire route I marked in yellow, a distance of about twelve miles. It included the Lost Pines Trail (which is mostly in the shaded area on the right side of the map), Scenic Overlook Trail, and some road mileage. Cody and I hiked (and ran a little bit) for nine miles on the Lost Pines, Roosevelt's Cutoff, and Scenic Overlook trails. It took all of us about three hours going clockwise on our respective loops from the red arrow and back. The trails we saw in the park were very well marked with maps and arrows at intersections (photo above). Each trail is color-coded. 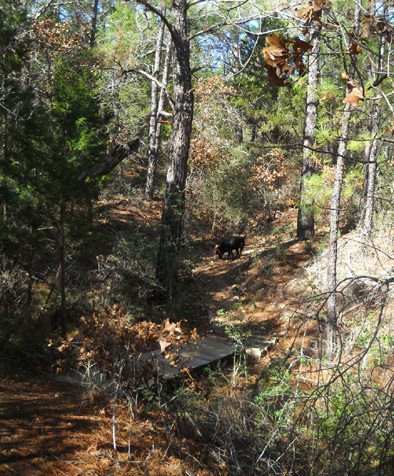 In the example above, I knew I wanted to bear left on the purple Lost Pines Trail. I never had any doubt where I was or where I was going. Jim and I were both pleased with the single track trail surfaces and general terrain, which is hillier than what we've been doing lately. It's also hillier than the trails at Huntsville State Park, where we're headed next. We were in and out of some ravines but didn't see any running water in any of the creeks. There were no clean ponds for Cody to cool off or drink until we were almost back to the truck, just a couple mucky waterholes. Since it was warmer than Cody and I are used to, we could have both used more water. Otherwise, I loved the hilly, curvy Lost Pines Trail and Roosevelt's Cutoff. There were very few long, straight sections yet the trails are "fast." The dirt trail surfaces have some sand in them; they probably dry out pretty quickly after it rains. There are some roots and rocks but most of the Lost Pines Trail and Roosevelt's Cutoff are pretty smooth. 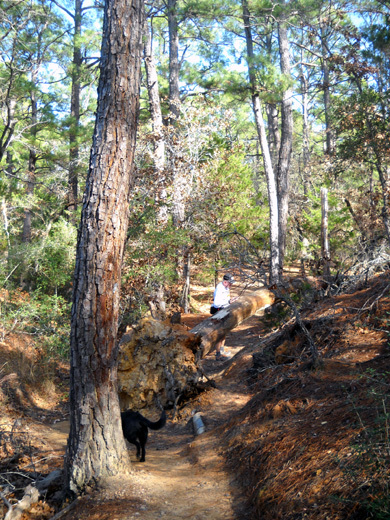 Most of the trails at Bastrop are shaded with the tall loblolly pines that give the trail its name. There are also some deciduous trees and shrubs in the mostly-open forest. I didn't see any flowers in bloom where I hiked. I doubt we'll ever camp at Bastrop or Buescher but if we stay in the Austin area again, we'll probably drive back over to one or both of these parks to run/hike on the trails. Running friends John and Marcy Beard have also told us about other nice trails in the area of Bastrop Lake, which is larger than the lake in the state park. 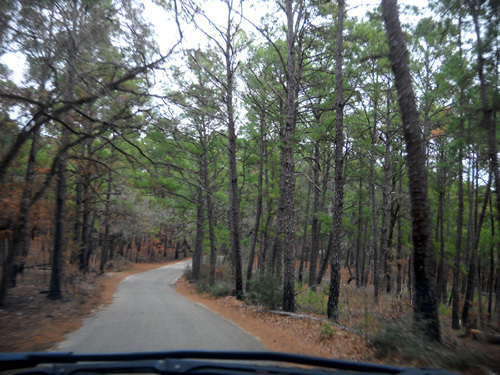 The roads and trails through the Lost Pines area are popular venues for foot and cycling races, too. John is participating in an adventure race soon in the Bastrop Lake-Bastrop State Park area. If Marcy wasn't working in New York right now she'd be on his team. I bet there are some trail running races in the Lost Pines area, too. 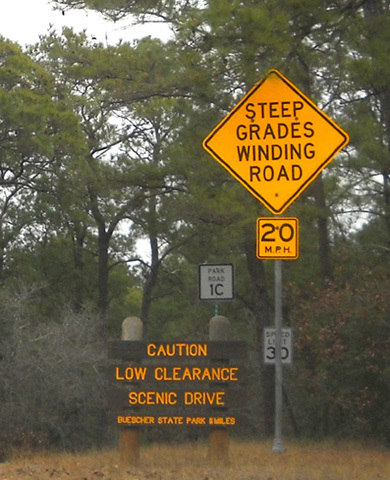 Part of the course for the popular MS 150 bike race from Houston to Austin uses the roller-coaster road through and between Bastrop and Buescher state parks. According to the race website, this is the largest event of its kind to raise money for the National Multiple Sclerosis Society. Last year 12,000 cyclists in this two-day, 180-mile (not 150) event raised $16 million for MS. This year's race will be held in mid-April. I'm enjoying our new Specialized TriCross cyclocross bike enough to consider someday doing a cycling "century" ride on it or my Terry Isis road bike, but 180 miles sounds painful! Maybe I can work up to something like that some day . . .